There is a wide range of medications available to control pain from milder, non-addictive drugs like Tylenol (acetaminophen) or NSAIDs to potentially addictive substances like opioids. Common examples of prescription opioids include Oxycontin (oxycodone), Vicodin (hydrocodone), morphine, and methadone. Medications for milder pain are usually available over-the-counter to anyone who wishes to purchase them, and can often control minor pain like a headache or aching muscles. But stronger medications, those which control high levels of pain including chronic pain, can also induce dependence or addiction. These medications are controlled by the government, which tells us whether they are available for purchase, whether we are eligible to purchase them, how we can buy them and lays out the consequences if we obtain or use them outside the law. What Is the Controlled Substance Act? In 1970, the United States Congress passed the Controlled Substances Act. This act describes which medications and substances will be controlled and puts those controlled substances into categories called schedules, based on their tendency to be abused. The Department of Drug Enforcement is in charge of enforcing the laws and also distinguishes which drugs have medical application and which ones do not. Individual states put further laws and penalties into place (rules which are continually evolving) and in recent years have over-ridden some of the federal laws. For example, cannabis, perhaps better known as marijuana, is still considered an illegal drug by federal statute but is legally possessed in several states in the United States. Schedule I: These are drugs that are the most easily abused but have no known, researched, medical application. They include heroin, LSD, marijuana, and ecstasy. According to federal law, these drugs may not be prescribed for any reason. While the federal laws may make their use illegal, in recent years some of the states have reviewed, and overridden laws about marijuana (cannabis), mainly for medicinal use but also for recreational use. Many people believe marijuana relieves their pain. Schedule II: These drugs also have a high potential for abuse, and are often used for pain control. Their use can lead to dependence, both physical and psychological. They include morphine, opium and opioids, methadone, oxycodone, and fentanyl. Schedule III: Less apt to lead to dependence than Schedule II substances are these drugs which may lead to high psychological dependence, but lower levels of actual physical dependence. Included in Schedule III are many of the combination pain relief drugs such as those which combine hydrocodone or codeine (Vicodin, Tylenol with Codeine). Schedule IV: Schedule IV drugs have a low potential for abuse as compared to Schedule III and may include Xanax, Valium, and Restoril. Schedule V: These drugs may contain limited amounts of narcotics, and are considered to present a very low risk of abuse. Many cough medicines and antidiarrheals are listed in Schedule V such as Robitussin and Phenergan with Codeine. The Institute of Medicine reports that 100 million Americans suffer from chronic, perhaps debilitating pain. They also estimate that lost productivity among workers with chronic pain amounts to 61 billion dollars per year. Clearly pain and its control have a huge impact on individuals, and on the economy, too. 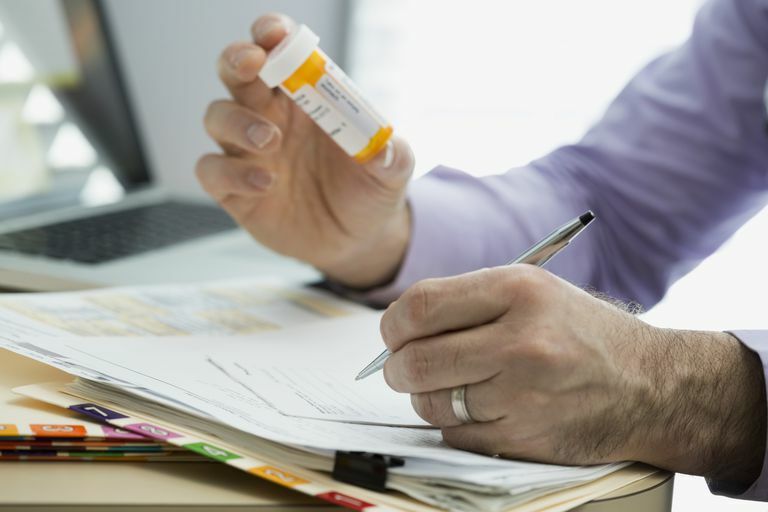 Doctors may recognize their patients are in pain, but because of the way the laws are written, they are hesitant, possibly even fearful, of prescribing certain medications (mostly opioids). Enforcement of the law may mean the doctor is arrested, fined, can lose his or her license, or all three. In addition and more commonly, many doctors are concerned about the potential for opioid use disorder, physical dependence (whereby a person develops withdrawal symptoms when the medication is stopped) or even opioid overdose and death from prescription opioids. This is a legitimate worry, considering that nearly 2 million people in the United States abused or were dependent on prescription opioids in 2014, according to the Centers for Disease Control and Prevention. There are also people, commonly known as drug-seekers, who show up in doctor's offices and hospitals pretending they have a medical need for prescription opioids. It's left up to the medical professionals to determine which patients really do have a medical need vs those who do not. This can be tricky, and some doctors are more experienced than others in determining who is drug-seeking. If your doctor is caught prescribing controlled substances to patients who are not chronic patients, and those violations become flagrant, then he or she risks arrest, fines and possibly losing his or her license. The penalties vary by state law, but not a week goes by that there isn't a medical professional arrested somewhere in the United States for bad prescribing practices, for the death of a patient who overdosed, or for outright prescription fraud. If your doctor is caught prescribing too much of any controlled substance to you, it puts him or her in that same position. If you overdose, he or she can be charged in your death. If you demand pain drugs because your prescription has run out, or because you used your prior prescription too quickly, then your doctor is faced with a choice: prescribe for you to temporarily relieve your pain, or keep his job. Is it any wonder that prescriptions for painkilling drugs are becoming more difficult to come by? Or that your doctor is reluctant to prescribe them for you. As a result, there exist a number of legal requirements and controls in the forms of paperwork, contracts and record keeping, to help the patients who need painkilling drugs get them, and to prevent those who don't need them from getting them. For instance, in 2016, the Centers for Disease Control and Prevention created recommendations for primary care doctors for prescribing opioids to adults with chronic pain—those who have pain longer than three months that is not due to cancer or end-of-life care. The purpose of this guideline is to optimize patient safety and medication benefit while minimizing the potential for opioid abuse or overdose. While prescription opioids may alleviate your pain in the short-term, they do carry a number of potential risks, including tolerance or physical dependence. If your doctor does prescribe opioids, it's important you review these risks, have timely follow-ups, establish treatment goals, and consider non-opioid pain-easing therapies whenever possible. Centers for Disease Control and Prevention. March 16, 2016. CDC Guidelines for Prescribing Opioids for Chronic Pain.